I have set goals for myself and I have shared these goals with family and friends, this created an expectation within me and within those I shared it with. One of those goals was that I’m going to walk again. Was that an unrealistic goal, at the point in time I don’t think so. Is it a unrealistic goal now, well I don’t know, in my head I’m saying to myself it is still possible, but my body and my heart is saying something different. I have applied every bit of myself to get back on my feet. Today I had to face the facts, that my destiny in life is going to be achieved within a wheelchair. I had to ask myself if this is the end of the world as I know it. The only answer I have is no. I will still have to get up every morning and go to work. 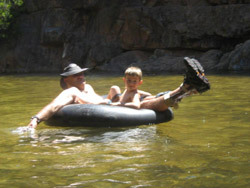 I will still have the time of my life with my Wife and Children. I will still love the freedom of the outdoors. I will still explore, I will still eat, I will still be Happy and Sad, I will still grow old. And most of all I will still face challenges and adversity in the face. The only difference is that I’ll be doing it sitting down. Believe me and believe me fully, this short letter has not come easy and I have not given up Hope, but for now, there is more to life. By forcing my mind and body to do this and to keep myself positive, I have actually made myself unhappy and frustrated. I would rather be a happy and smiling Mark in a wheelchair, than having to cope with the emotional turmoil I have put myself through the last year. Believe me that I will not change my way of thinking and doing things, I will still look every day square in the eyes, and I will still take on a challenge and make the best of it. I hope you can all understand, and respect my decision. And always remember it is still the same man only sitting down. And I get better parking than all of you. 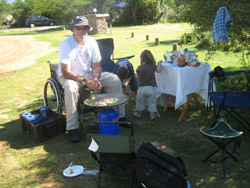 Mark sustained a L1 incomplete spinal cord injury after a motor vehicle accident at the end of November 2007. He is 36 years old and was employed in the building industry at the time of accident. Within 3 months he returned to work as a factory manager at Shonaquip. He was initially rehabilitated at UCT Private and then attended outpatient rehab at WCRC till the end of 2008.